Create a sensory experience by making use of three types of plants—night-flowering, night-fragrant and night-reflective. Night-flowering plants will open or bloom at dusk, night-fragrant plants will produce beautiful scents and night-reflective plants have glistening white or silver foliage that glimmers under the light of the moon. There are specific types of flowers, plants, and colours that make up the best moonlit gardens. Be sure to stay away from deep, dark colours and focus on reflective colours such as, white, silver, pale yellow and pale pink. Try choosing a few plants from each group and create a well-balanced composition, using a variety of bushes, vines, ground cover and flowering plants. Evening Primrose: White heart-shaped petals open every evening in the summer with a light, lemon and honeysuckle scent. Angel’s Trumpet: Huge white flowers open at night and remain open into the next day. Night Phlox: Almond-vanilla scented flowers that bloom at night. Climbing Hydrangea: Features large white flowers that bloom at night and leaves that change color from pink to gold to dark green. Lavender: Silvery-gray foliage and a sweet, calming scent. Night-Blooming Jasmine: Offers an intense night fragrance and is a staple in many evening gardens. Gardenia: Very fragrant, night-blooming shrub with white flowers. Moonflower: Trumpet-like blooms unfurl from a vine at night and give off a magical scent. Tuberose: Super fragrant, tubular white flowers that bloom in late summer. Licorice: Bears furry, silver heart-shaped leaves and works well as an accent in a garden or potted arrangement. White Verbena: Bears small, white clusters of flowers and is great for creating ground cover or for edging and filling in gaps in gardens or containers. Lamb’s Ears: A hardy ground covering plant with silver-white leaves. Maiden Grass: Also known as ‘silver grass’, this is one of the most widely used ornamental grasses. There are many leaf sizes and textures available. Hosta: Known for beautiful foliage that can contain patches of white, yellow and shades of green that are perfect for reflecting moonlight. If your nighttime garden is big enough, add a table and chairs or bench for evening entertaining. Light-coloured outdoor furniture such as white or silver will add a wonderful reflective quality to the area. If you’re working with a small porch or balcony, create a potted version of the midnight garden using some of the same plant suggestions and combinations. 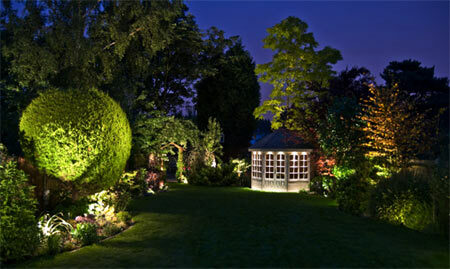 Garden lighting can be used to enhance and accentuate a night time garden. You can go all out with solar-powered spotlights or keep things simple by putting out luminaries, lanterns or candles while you’re kicking back or entertaining. 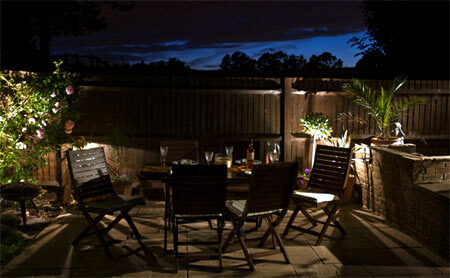 Either way, lighting can add an extra-special glow and romantic ambiance to your night garden space. For those more eco-conscious be sure to take a look at the Radiant Lighting range of LED lights for the garden. Once you have your garden planted, simply wait for night to fall and enjoy! If you populate your garden primarily with perennial plants they’ll re-emerge for you each year, giving you the gift of a midnight garden that’s easy to care for and appreciate.